An Alliance for those who enjoy letter writing and postal adventures. Come see us in our home town! We're at the Renegade Craft Fair this weekend, September 7th & 8th, from 11AM to 7PM. Our booth number is 236 and we're at a corner between Wolcott and Honore. Look for our air mail striped tent canopy. We'll have our wares for sale and a number of vintage items as well. 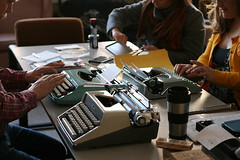 Why not come out and take home a typewriter you've been eyeing, and save on the shipping cost? See you there! In this era of instantaneous communication, a handwritten letter is a rare and wondrous item. The Letter Writers Alliance is dedicated to preserving this art form. Prepare your pen and paper, moisten your tongue, and get ready to write more letters! Tips on how right here. The L.W.A. was established in 2007 by Kathy Zadrozny & Donovan Beeson. 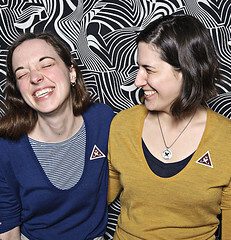 These two ladies manage every aspect of the Alliance, from design, to packing orders, to maintaining the website. The L.W.A. is a labor of love and we are happy you have joined us in sharing a love for letters. Above photo of Donovan & Kathy by GlitterGuts. Your donation will fund the free stationery & envelopes we give to Letter Social patrons. You can also donate postage or supplies to the LWA PO Box.